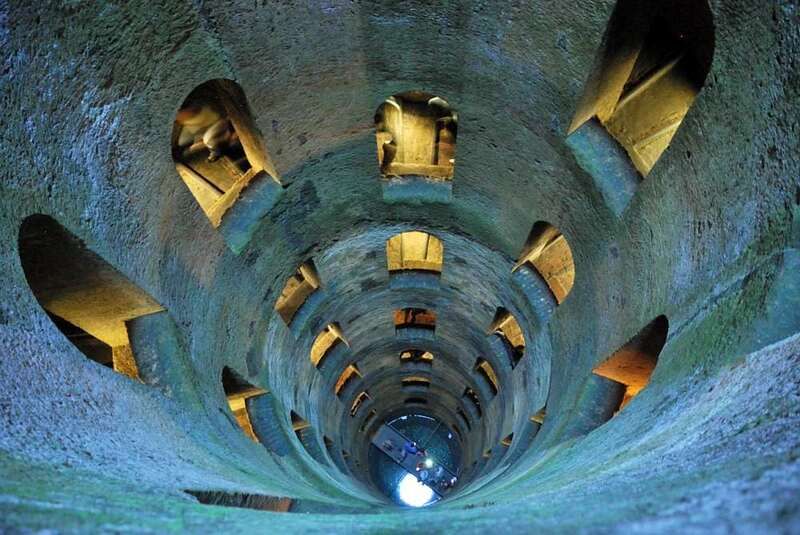 Explore Orvieto Corpus Domini astonishing cathedral and descend the impressive staircases of St patrick’s well. Sitting atop a high volcanic cliff, the hill town of Orvieto makes an impressive sight. 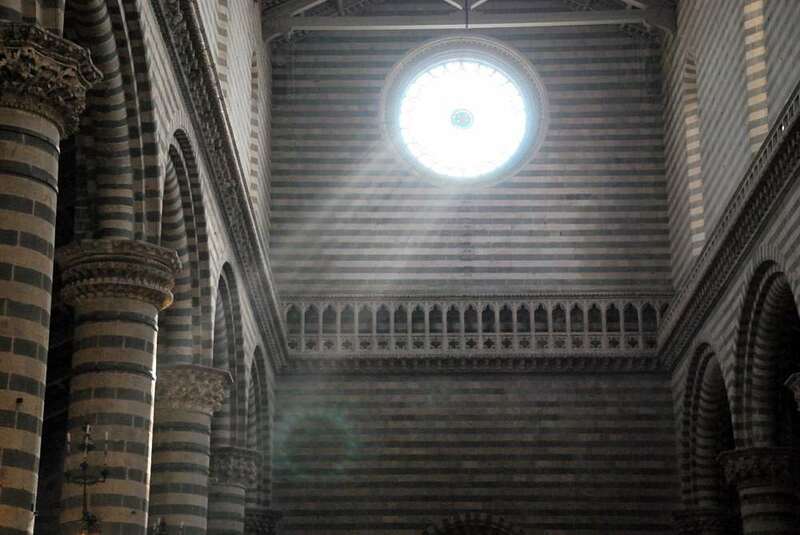 Inhabited since Etruscan times, Orvieto’s monuments and museums cover millenniums of history and its stunning cathedral is one of the best medieval monuments in Italy. One hour train from the Capital, Orvieto is a perfect destination for a day trip from Rome, and a convenient location to leave your rental car after a self driving Tuscany tour. A funicular connects the train station to the old city, up on the cliffs. I can’t think of anything easier! 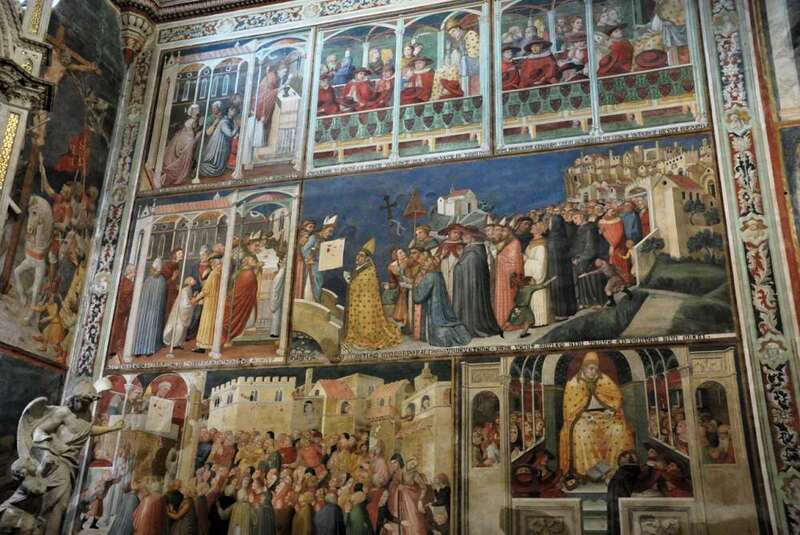 Two are Orvieto absolute Must Sees: the Duomo and St Patrick Well. That said, Orvieto is a delightful town, with lots of things to do and see (what about exploring its 440 Etruscan caves? ), and if you are not on a tight schedule you can spend one or two days in town, or use it as a hub to explore the southern part of Umbria and of Tuscany (click on the image below to access Google maps and get a feeling of the distances). Let’s start by the Duomo. 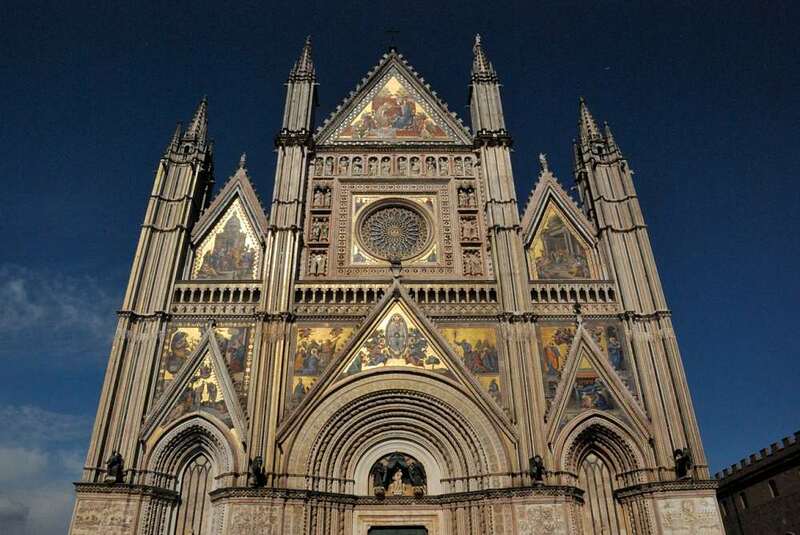 Symbol of the city of Orvieto itself, the Duomo is one of the most beautiful cathedrals in Italy. Started in 1290, Orvieto’s duomo was originally planned in the Romanesque style, but as work proceeded and architects changed, it became more Gothic. The black-and-white marble banding of the main body of the church is surpassed and complemented by the polychrome mosaics of the façade. But why such a marvelous cathedral in a rathe small town? Well, as usual in Italy, because of a miracle. The Miracle of teh Corpus Domini (“Body of the Lord”). In the 1260s, a skeptical priest — who doubted that the bread used in communion was really the body of Christ — passed through Bolsena (a few miles from Orvieto) while on a pilgrimage to Rome. During Mass, the bread bled, staining a linen cloth. 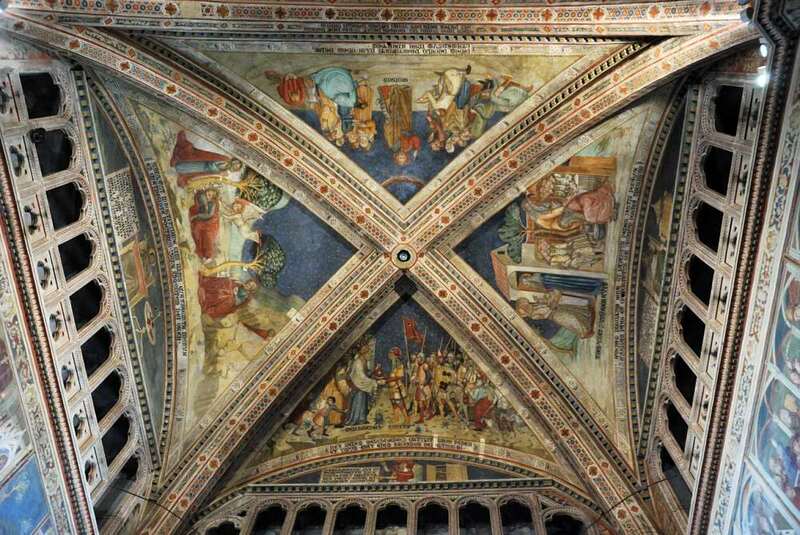 The cloth was brought to the pope, who was visiting Orvieto at the time. Such a miraculous relic required a magnificent church. 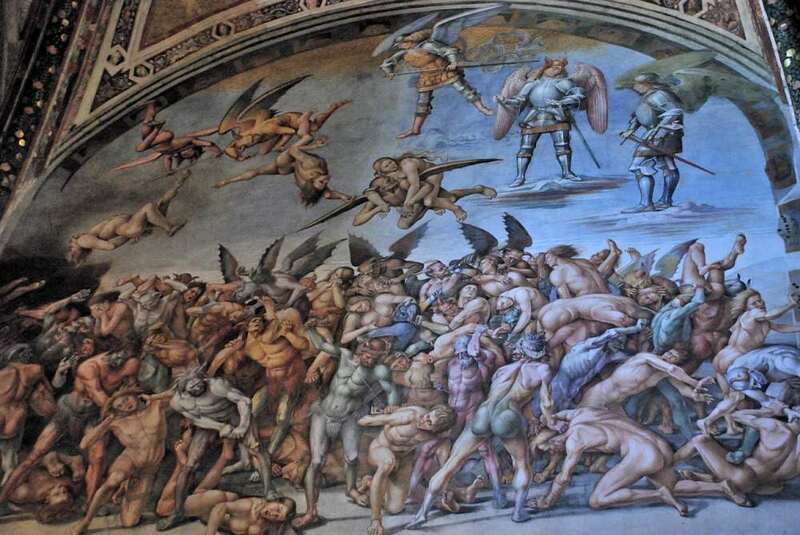 Inside the Duomo, you can’t miss Luca Signorelli’s fresco cycle, Il Giudizio Universale, in the Cappella San Brizio, to the right of the altar. 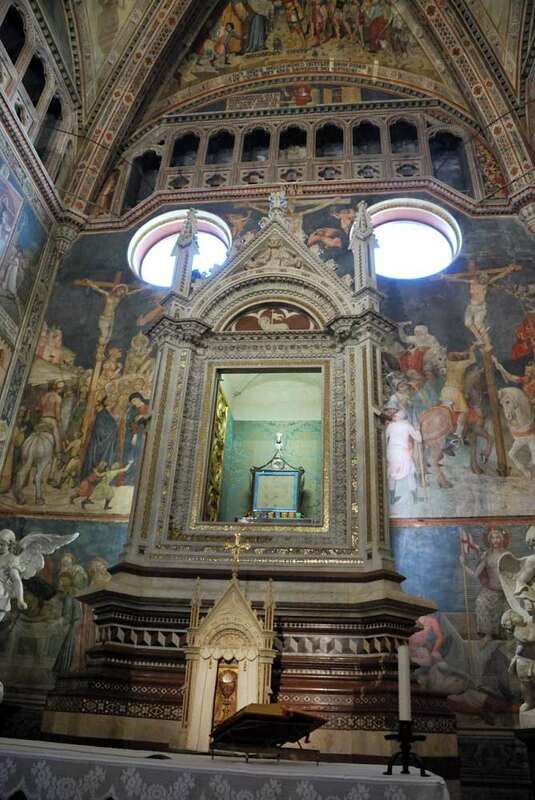 To the right of the altar, the Cappella del Corporale houses, of course, the Corporale (admirable work of the goldsmith Ugolino di Vieri) and the tabernacle containing the Holy Body of linen stained by the blood of Jesus at the Miracle of Bolsena (the “Corpus Domini”). The frescoes by Ugolino di Prete Ilario admirably depict the miracle. St Patrick’s Well is an architect marvel, and a perfect integration of engineering audacity and architectural décor. 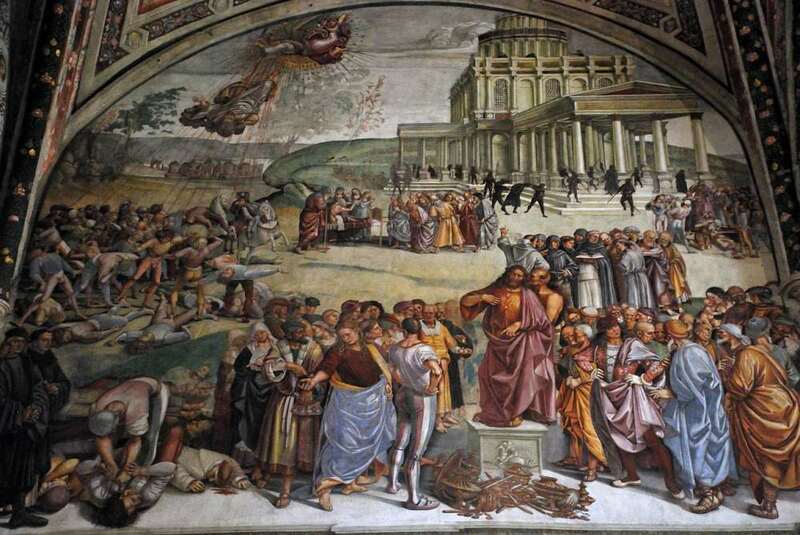 When in 1527, during the sack of Rome, Pope Clement VII had to take refuge at Orvieto, the town looked destined to become a place of regular papal refuge. Hence the need for a reliable water supply in case of siege: not easy for a town build on top a f a high tufa cliff! Antonio da Sangallo the Younger was then commissioned the construction of a Well designed to tap the water veins underlying the cliff. Sangallo created an ingenious system of two spiral staircases that never meet. They create a way to get in and out of the Well (about 53 meters deep and 13 meters wide) without any traffic problems for the long donkey lines that transported water bags in and out the well. Actually the 248 steps are large enough to accommodate the donkeys. Seventy windows cut into the wall light the stairs from the central shaft. Going down the well is a really fascinating experience you shouldn’t miss. 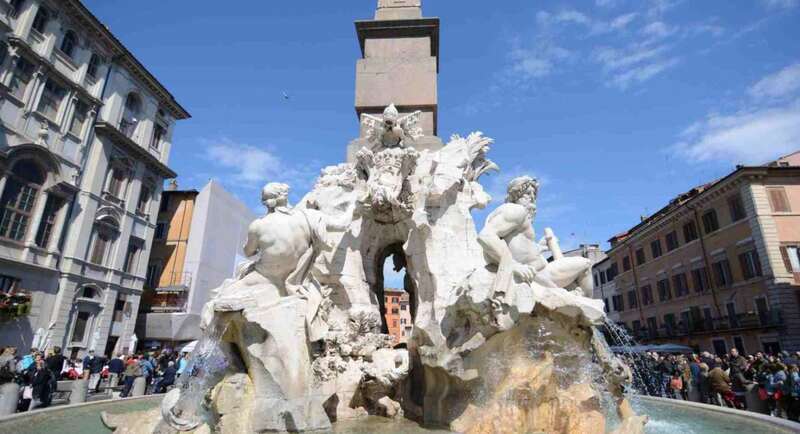 When you are done with your visit, just loose yourself in the delightful medieval streets, for a Gelato or a dinner in one of the many delicious restaurants. J-P, Orvieto is one of my FAVORITE cities in Italy! Last year we were there for the Fest del Corpus Domini in May! Simply awesome! 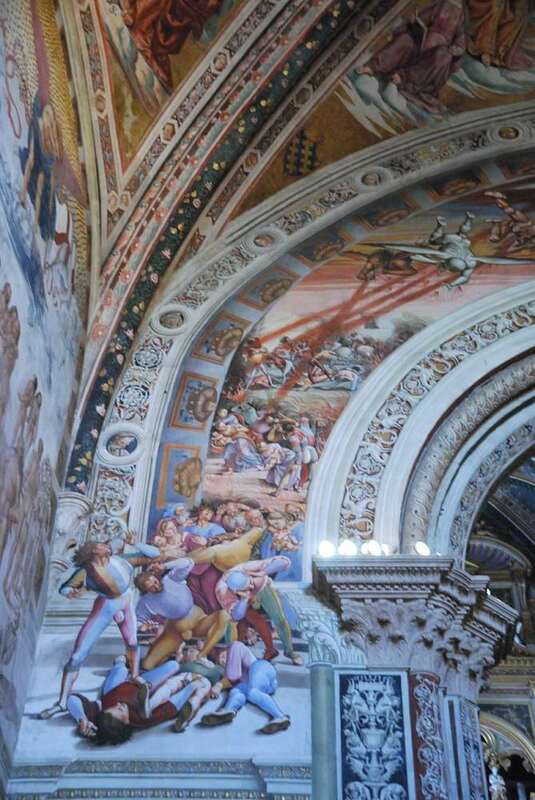 I loved Orvieto when I first visited–and now I want to go back. I didn’t know about ST. Patrick Well! That’s amazing. Definitely worth a trip. Thanks Jean-Pierre! You’re right, it really deserves a visit. Actually I discovered that there’s a second well, recently discovered, less famous but much more ancient, since it dates back to Etruscan era. So I’ll have to go back to Orvieto as well! Great post, wonderful pics, thanks! 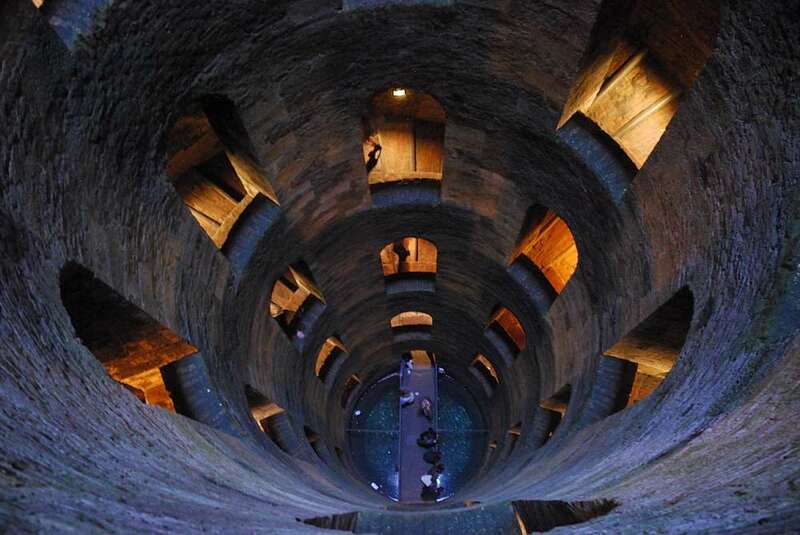 I love Orvieto and have been several times, but I have not seen the well! I must go back, thank you for the tip. It’s really astonishing, and I had wanted to see it for years (beacause of what my grandma kept on telling me about my pockets size…)! I had lunch in a fabulous restaurant that was in an ancient rope factory. Can anyone tell me the name of it and if it was damaged in the quake? 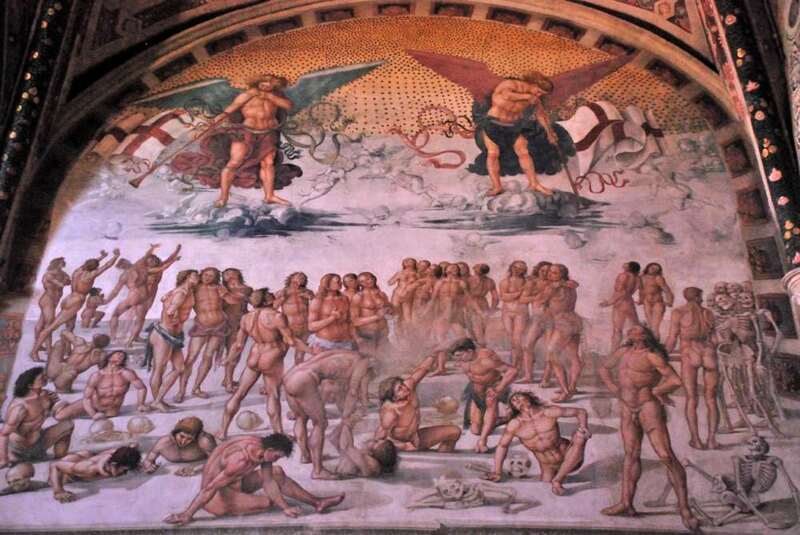 Could have been “Le grotte del Funaro” (http://www.grottedelfunaro.com/)?